Dental inlays and onlays are used to restore the back teeth that have a mild or moderate decay. It can also be used for cracked teeth. Inlays and onlays is a good alternative that your Simi Valley dentist provides you with, to avoid placing a whole crown on the tooth. It is called “inlay” when the reparative solution is bonded with the center of the tooth. It is called “onlay” when the complete chewing part of the tooth needs coverage. The process generally involves two visits to your Simi Valley dentist. Your dentist will us an anesthetic where the inlay or onlay will take place. Any decay will be removed. 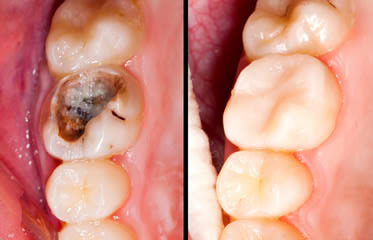 Then a mold will be taken of the damaged tooth. The inlay and onlay is not made in the dentist office, it has to be sent to a lab. Usually these are made of porcelain, composite resin or gold. Between visits, the dentist will place a covering over your tooth to protect it. At the second appointment the inlay or onlay will be adhered to the tooth. There should be little to no discomfort as Dr. Muradian does an excellent job. Please consider using an inlay or onlay as an option instead of getting a crown. Call us now to book your appointment so we can help you care for your teeth as well as possible.